Learning difficulties don't have to keep your child from becoming a successful, motivated learner! Our students, kindergarten through eight grade, are bright and talented individuals who are challenged by a learning difference like dyslexia or ADHD. Our teachers are passionate, creative experts who help each student excel in a demanding and complicated world. Our classrooms are specially designed to foster organization, promote attention, and bolster academic success! 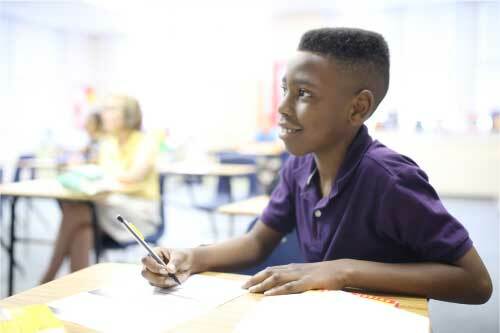 If your child’s learning difference is keeping her or him from fully reaching full potentials in school, contact us today to start your child's journey to learning what classroom and personal success feel like! Contact our Admissions Director, Erin Whicker, at erin.whicker@depaulschool.org or (502) 459-6131 you have any questions about our school, our programs, tuition, and/or admissions process. The de Paul School is not an appropriate school for students who have been diagnosed on the autism spectrum (including Asperger syndrome), nor for students who would require special therapies or interventions due to behavioral difficulties, defiance, or extreme anxiety. How did you hear about The de Paul School?